On my search for the best hamburger on the Gulf Coast, I stumbled upon The Blind Tiger, a restaurant nestled up against the harbor in Bay St. Louis. As soon as I arrived in the restaurant I was greeted with a wonderful and eclectic atmosphere. My bubbly waitress, Smash, recommended the “Eastwood Burger.” She assured me that it would not disappoint. I had been dreaming of eating a great burger all day; I did not want to be let down. I waited for a few minutes, eyeing the water and people watching. The Blind Tiger is a mix of young and old, salty and sweet. It is the kind of place that a great burger could come from. The place really did not have a formal menu, they just sort of put up what they feel like making today. Great concept. 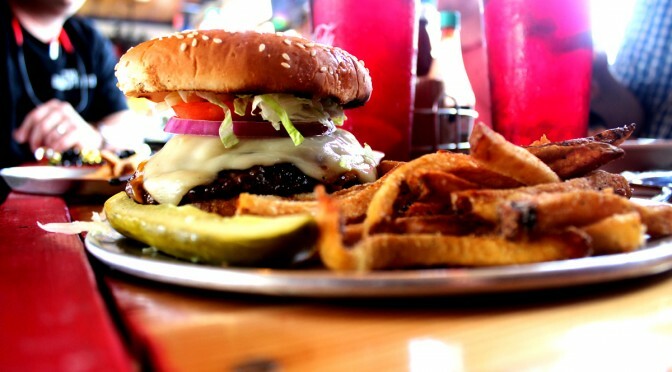 Searching for the best hamburger on the Mississippi Gulf coast. During the short wait while the chef was preparing my meal, I took the time to look at all the pictures and decorations all over the walls. Through the windows on either side of the restaurant you can see the streets of Bay St. Louis or the tide of the Gulf of Mexico. The Blind Tiger is the kind of place you can hang out and grab a drink with friends or bring a promising business acquaintance. I didn’t have to wait long before this triumph of meat appeared before me. This chargrilled work of art is topped with cheddar, Monterey Jack cheese, caramelized onions, all stacked up on two buttery sesame seed buns. At first glance this burger lived up to it’s impressive name: a rough tough burger that is not to be taken lightly. Gripping the burger, I found myself savoring every bite of the gigantic burger. The flavors of the patty were complimented well by all the toppings. This burger was no ordinary burger; it was in my opinion THE burger of the Gulf Coast, and I wished this burger would have never come to an end. I later learned that the burger was a handmade patty from fresh ground meat. I couldn’t thank the wonderful Smash enough for recommending this burger to me; I couldn’t have asked for a better, more well- prepared lunch. The atmosphere was inviting; the tunes were grovey, and the food was amazing. Be sure to grab plenty of napkins when consuming this burger masterpiece at the one-of-a-kind restaurant, The Blind Tiger. 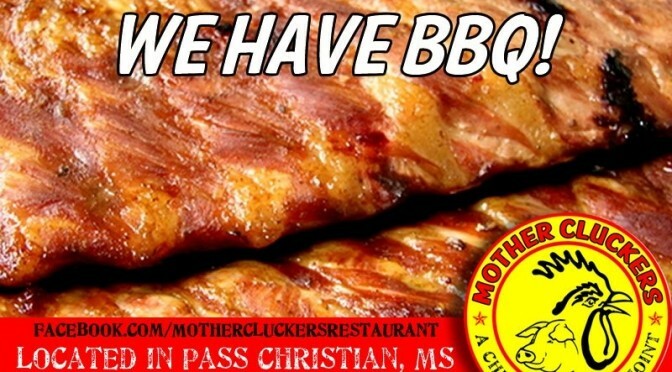 In Southern Mississippi, we take our food very seriously, and desserts are no exception. 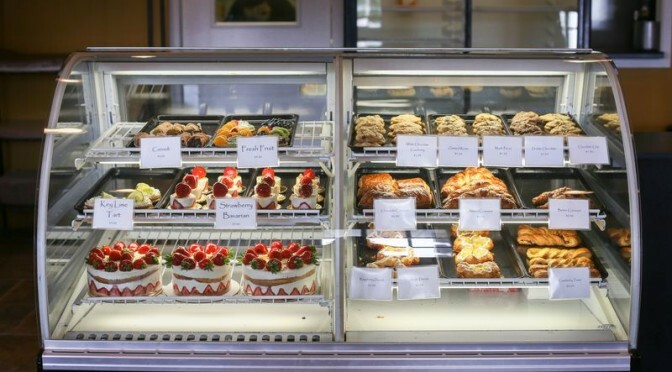 A great party or special occassion isn’t the same without some showstopping sweet, and Fleur De Lis Gourmet Bakery is at the top of the list for that sort of thing. You can stop in for a quick treat, or call ahead and have them create a DELICIOUS, European-inspired confection for any event. Holy Trinity Catholic School Annual Po Boy Sale! The Po Boy and Chef Salad Sale is one of the most popular fundraisers that Holy Trinity does. Everyone has to eat, so why not do it for a good cause. The Po Boy Sale will be held on September 28th, 2011. All order must be placed and paid for by Wednesday Sept 21st. Have your order delivered (free of charge) or pick it up at the OLG Community Center between 10:30am – Noon. To place an order, contact the school 228-467-5158 or print the order form (linked below) and bring it to the school. Please put a note telling them that Amanda Whitney referred you.